· Just over 1 in 4 of today's 20 year-olds will become disabled before they retire. · Over 37 million Americans are classified as disabled; about 12% of the total population. More than 50% of those disabled Americans are in their working years, from 18-64. · 8.8 million disabled wage earners, over 5% of U.S. workers, were receiving Social Security Disability (SSDI) benefits at the end of 2012. · In December of 2012, there were over 2.5 million disabled workers in their 20s, 30s, and 40s receiving SSDI benefits. 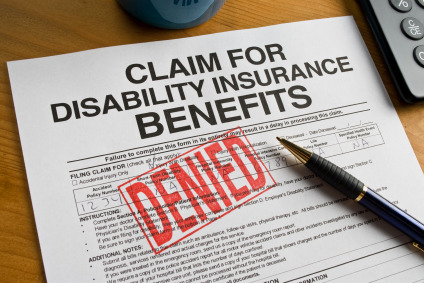 · 65% of initial SSDI claim applications were denied in 2012. · Can your family live on $1,130 a month? That's the average monthly benefit paid by Social Security Disability Insurance (SSDI) at the end of 2012. · 7.3% of SSDI recipients received less than $500 monthly. · 46% received less than $1,000 per month. · 93% received less than $2,000 per month. · Less than 5% of disabling accidents and illnesses are work related. The other 95% are not, meaning Workers' Compensation doesn't cover them. On July 26, 2015, we will celebrate the 25th anniversary of the passage of the Americans with Disabilities Act (ADA) signed into law by President George H.W. Bush in 1990. It is one of the most comprehensive pieces of legislation for the disability community. It prohibits discrimination on the basis of disability in employment, public services provided by state and local governments, public services operated by private entities, transportation, commuter authorities, or telecommunications. Living in the community with family and friends, working at a typical job in a regular business, and participating in community affairs is a right of citizenship, not a privilege for individuals with disabilities, as for all Americans. This right was confirmed with the passage of the Americans with Disabilities Act in 1990, affirmed with the 1999 Supreme Court’s Olmstead decision, and repeatedly reaffirmed in the years since that landmark decision. Disability rights are a CIVIL RIGHTS issue. Accessibility to public places & social programs, equality in employment practices and education – these are all federally protected rights for every person in the United States, including those with disabilities. We must stop viewing individuals who are disabled as subhuman or charity cases. Having ramps and elevators installed at rec centers; having ample aisle space at department stores and restaurants; providing larger stalls with handrails in public bathrooms – these are not things that people with disabilities should feel grateful for. It is not a privilege to have appropriate supports or removals of barriers. It is the LAW. 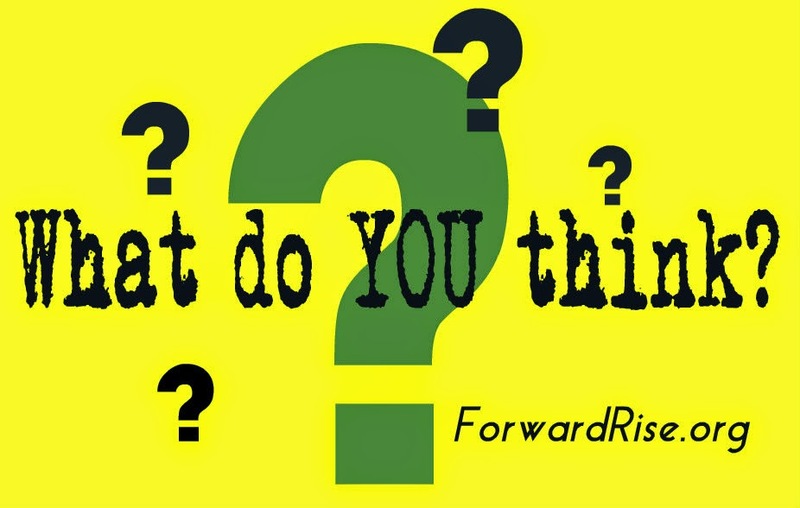 Forward RISE is a NYS nonprofit committed to the real inclusion of people with disabilities through knowledge-sharing workshops and inclusive social experiences. 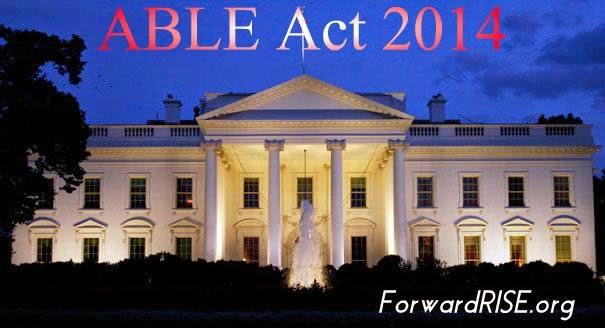 The Achieving a Better Life Experience Act (ABLE) was finally signed into law by the President on December 19, 2014. Tax-free savings accounts can now be built for a population that has historically been forced to live in poverty. Up until now, in order to be eligible for SSI and Medicaid, a person could not have more than $2,000 in cash and property ($3,000 for couples) or make more than $700 monthly (!) in order to be eligible for Medicaid or SSI. This means they can’t save money for things that Medicaid and SSI don’t cover like education, housing, a job coach or transportation. While the rest of society is encouraged to save for emergencies, unforeseen expenses and rainy days, people with disabilities – who have naturally higher expenses and higher medical needs – were forced to scrape pennies and do without due to archaic laws and discriminatory notions held by society in general. This is a great step forward in the right direction for this community. Let’s hope the regulations are completed sooner rather than later so that individuals and families can begin saving for a better life! WARNING: This article talks about very abusive situations forced upon people with disabilities. Please be aware that it may be upsetting to some readers. The stories that follow are true and absolutely heart breaking. When we think of civil rights movements the plight of African-Americans, women's suffrage and gay rights immediately spring to mind. However, there is another group of individuals who have been fighting for their fundamental rights for even longer and who have not yet attained the respect of the general population. The history of the disabled population in the United States is a long and sad one. Individuals who either were born with their disabilities or acquired them later in life from injury or disease were largely ignored and hidden away in institutions. What began as an attempt by a physician in the late nineteenth century to educate and train them quickly turned into a movement towards automatic institutionalization. A stigma never before felt by this population developed and they became the targets of chronic abuse by their families, the medical community, and society en masse. Not until the middle of the twentieth century, or thereabouts, were the disabled regarded important enough to be protected and supported. The civil rights movement of the disabled brought the atrocities and low living standards they bore to the forefront of society’s awareness. Through government legislation, improvements in medicine, journalistic exposés and a massive public outcry, deinstitutionalization was finally set in motion. We will see, however, that often there is a lack of correlation between law rhetoric and the concrete application of policy. We see that legislation passed with the intent of assisting a whole class of people does not always work in the way it is expected to. Unintended consequences are not uncommon and are in fact quite the norm; what looks good on paper does not translate to affectability in real life. Furthermore, the way in which the U.S. political system is set up allows for loopholes to be built in to policies. Disability awareness is important to understand how and why this population has suffered as a result of being segregated from the rest of society. An individual’s disability can have profoundly disastrous effects on a family and can lead to isolation, mental health problems that would otherwise not be present and abuse. Discrimination and stigmatization are the byproducts of a society based on the concept that everyone must be “normal”. In order to make changes, we must first look back to see where things went wrong. We must then look at what has been done to change this and how we can continue defending the rights of those that may not have the ability to advocate for themselves, but deserve to have that protection just as much as non-disabled citizens. 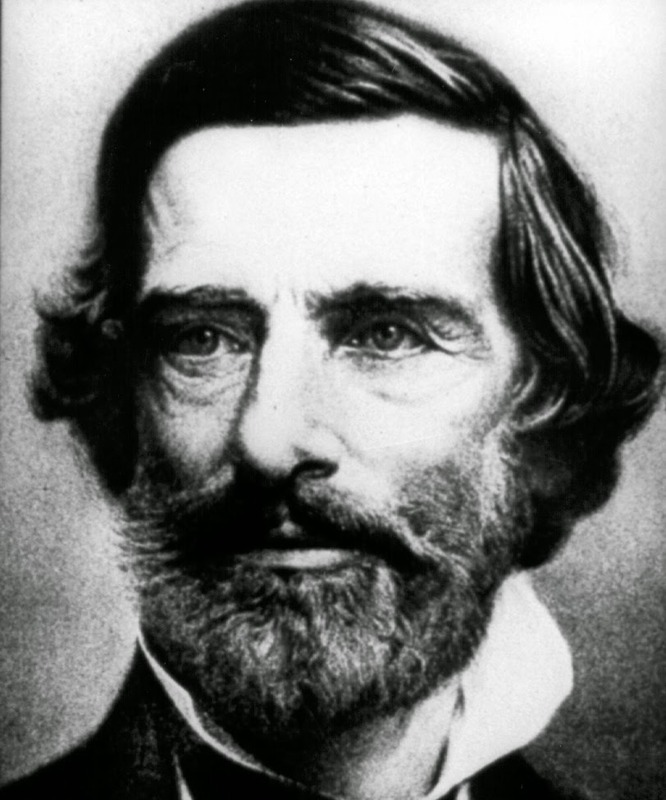 Dr. Samuel Gridley Howe was a very important historical figure in the mid-19th century. An abolitionist and physician, he also advocated for the blind and "feeble-minded". He believed in the idea that these individuals could be educated and that they could serve a valuable function within society. He started a small school in his father's home by gathering a handful of local youths who were blind. It proved successful and soon outgrew the walls of his family's home. In 1832, he established the Perkins School for the Blind in Massachusetts. He was its first superintendent and continued to be so, tirelessly, until his death. He is also seen as the precipitator of what is now known as the institutionalization movement that began in the 1850's. The industrialization of society in the early nineteenth century called for a more-educated population. Those who did not do well in the newly developed public education system were labeled "feeble-minded". They were ridiculed and typically experienced horrific living conditions. Dr. Howe was sensitive to their lives and headed a legislative commission in 1846 to study their situation. In all, over 700 "idiots" were identified, half of whom Dr. Howe felt could be helped with teachers and education geared towards their specific needs. He believed they could be taught self-care and to do simple labor. In 1849, his dream was realized and the Massachusetts School for Idiotic Children and Youth was established in Boston with the use of public funds. Over the next ten years, similar schools were established in several states. These schools were intended to have a family feel to them. The objective was to teach the students skills they could use, such as farm or household chores, to earn a living when they returned to their original communities. Although institutionalization began as a humanitarian effort, it soon took a turn in another direction. The communities from which these individuals came were not accepting of them upon the completion of their schooling. The feebleminded were viewed as a social burden and “normal” society felt they were better off living at the schools permanently. Dr. Howe staunchly opposed permanent institutionalization. In his final report to the trustees of the Massachusetts School for Idiotic Children in 1874 when he retired, Howe warned of the permanent segregation of the "feebleminded," insisting that they should be integrated into society. "Even idiots have rights . . . !” he wrote. It would be another half-century before others began to believe in this vision. The school eventually came under direction of Walter Fernald who was a supporter of segregating "idiotic" children from the rest of society. The tragedy that unfolded resulting from the incarceration of feeble-minded, mentally retarded, disfigured or otherwise abnormal individuals was set in motion. Our history is riddled with atrocities that the "hidden" population was subjected to. One such story begins with Fernald and the Massachusetts School. It was found that a large number of mentally impaired children being "treated" at this school actually scored in the normal range in their IQ tests (Walter E. Fernald State School). There were many reports of physical and sexual abuse which were not exclusive to this institution. Throughout the country, for the next fifty years, institutions initially intended to serve those that had a disability became overcrowded, horrific institutions referred to as "snake pits". States maintained these dilapidated monstrosities through "legislative penny-pinching" (Maisel, 1946) under the guise of public service when in actuality they cast aside the needs of those who needed the most assistance. The abuse endured by this population stemmed from several causes. There was found to be severe understaffing and high turnover rates at all of the institutions investigated. The number of physicians, nurses and attendants available were far below the minimum state standards. At a hospital in Warren, Pennsylvania, for example, the average daily patient load was twenty-three percent above what it was actually capable of handling (Maisel, 1946). There were four physicians – one for every 640 patients – when the official schedule called for 12 and any decent standard would require from 18 to 25 (Maisel, 1946). The base pay of attendants, less than $900 a year, was far below the beginning pay rate of $1950 for prison guards even though the attendants' job was more dangerous and less pleasant (Maisel, 1946). Many doctors were incompetents, alcoholics and psychotics who could hold no position in well-run institutions where cure is the objective (Maisel, 1946). It was extremely rare to find a case of a doctor who was genuinely interested in curing or helping these patients; it was more of a case of keeping these patients "in line". These factors, along with the stigma of being "feeble-minded", perpetuated the accepted practice of shutting away these people by any means necessary. Patients were confined to restraints for days and weeks at a time. These restraints consisted of thick leather handcuffs, locks and straps, and restraining sheets that were used to tie ankles, necks, and chests to beds, benches and chairs. In a high number of hospitals, chemical restraints were also used. Drugs that would normally only be prescribed and administered by doctors and nurses even in those times were being used haphazardly by untrained attendants. There was a reported case in a Pennsylvania state hospital of a man in his mid-20's who was over-sedated by attendants as their method of keeping him under control. He ultimately died because his sedation was not overseen by a doctor; rather, there was a "free hand" administration of drugs rampant in this particular hospital (Maisel, 1946). Many hospitals did not properly feed their patients. The food served was likened to what could be found in garbage cans. At a New Jersey hospital an attendant noted that he had "seen cole-slaw salad thrown loose on the table, [and] the patients [were] expected to grab it as animals would…”(Maisel, 1946) There were many cases where the patients starved to death because of not receiving the minimum nourishment necessary to sustain life. Many could not feed themselves, and the shortage of workers meant residents often did not eat properly (Dugger, 1993). Byberry Mental Hospital was an infamous institution known for its decrepit building conditions and treatment of patients. The wards were overcrowded to the point that the floors could not be seen through the rickety cots, while thousands more slept on the bare floors (Maisel, 1946). Hundreds of patients were not given a stitch of clothing and were forced to live in bare rooms with concrete floors. They were not given anything to occupy their days or even have chairs or beds to sit in. They lived in filth; the rooms smelled of urine and feces. Daylight was their only source of light and even that was filtered in through half-inch holes punched into steel-plated windows; cloudy days and nightfall meant hours and days of blackness with no relief. The cries of the insane echo[ed] unheard from the peeling plaster of the walls (Maisel, 1946). Willowbrook State School was a New York state-supported school for children with mental retardation from the 1930's through 1987. An exposé in 1972 showed that it, too, was overcrowded, housing over 6,000 children when the mandated maximum was 4,000. It became known as a warehouse for New York City's mentally disabled children (Willowbrook State School). As many as sixty extremely disabled people were packed into one big locked room during the day, for years on end, with only a few attendants to supervise (Dugger, 1993). A close investigation showed patients were forced to live with inadequate sanitary facilities which virtually guaranteed the spreading of disease. Eugenics is another despicable part of the history of the disabled community. This trend, which had its inception towards the late 1800’s, attempted to improve the quality of American citizens by implementing restrictive social policies that discouraged marriage and/or reproduction of individuals who were presumed to have inheritable undesirable traits. This movement sought to link social ills such as crime, prostitution, poverty, juvenile delinquency and promiscuity to people with cognitive disabilities (Snyder & Mitchell 624-625). It is also in this movement the term “feeblemindedness” was created. There was a tiered hierarchy of defectiveness developed in order to be able to categorize different levels of feeblemindedness. Idiots referred to individuals with a mental age of two years or less; imbeciles represented those with an arrested mentality of three to seven years; and morons referred to those attaining a mental age of no more than twelve years of age (Snyder & Mitchell 624-625). Using this pseudo-science as a rationale, prominent figures of the early twentieth century attempted to purify the American race by passing legislation legalizing compulsory sterilization of individuals believed to be "feeble-minded", epileptic, or otherwise “socially inadequate” individuals. Because this latter criterion was so broad the number of people who were at risk of falling into this category was almost infinite. Those who were institutionalized were almost guaranteed to be sterilized. Approximately 60,000 Americans were sterilized due to compulsory sterilization of institutionalized patients. Although it was a topic of interest throughout the world, the United States was among the less than a handful of countries most involved with this pseudo-science. Between 1907 and 1937 thirty-two states required sterilization of various citizens viewed as undesirable: the mentally ill or handicapped, those convicted of sexual, drug, or alcohol crimes and others viewed as "degenerate"(McCarrick & Coutts, 2010). The most infamous case of eugenic sterilization was that of young Carrie Buck. Shortly after her birth, her mother was placed in an institution for the feebleminded. Carrie was raised by foster parents and attended school until the sixth grade. At 17, she became pregnant. Her foster parents committed her to an institution on the grounds of feeblemindedness and promiscuity. She gave birth to a daughter who was adopted by her foster parents. The child died at the age of eight due to complications resulting from the measles. Soon after being committed, Carrie was picked as the first patient to undergo forced sterilization after the enactment of the Eugenical Sterilization Act in Virginia. Officials claimed that Carrie and her mother shared the hereditary traits of feeblemindedness and promiscuity therefore Carrie was the "probable potential parent of socially inadequate offspring." (Lombardo) In Buck v. Bell (1927) the Supreme Court of the United States upheld the sterilization law, with Justice Holmes infamously proclaiming in his opinion “Three generations of imbeciles are enough.” Carrie Buck, along with her daughter, Vivian, was sterilized. 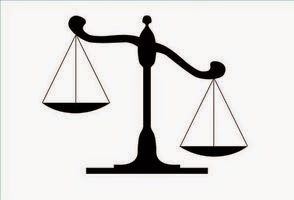 But this “justice” was in actuality an abuse of government and law which by extension was abuse of “degenerate” citizens. Carrie was not promiscuous; she was raped by a nephew of her foster parents who sought to cover up the family embarrassment by institutionalizing her. At her trial, “experts” who had never even met with Carrie testified to her feeblemindedness and moral inadequacies (Lombardo). Not only was her defense attorney childhood friends with the prosecuting attorney, he was also a longtime supporter of sterilization and a founder of the colony to which she was committed (Lombardo). School report cards showed that Carrie had passed each year with very good marks and Vivian had made the honor roll (Pitzer, 2009). She and countless others were the victims of corrupt individuals who used their education and standing in society to abuse the judicial system in order to reach personal political ends. Fortunately, we have seen the end of compulsive sterilization albeit more than a little late for the more than 65,000 people in the United States alone who were forced to endure this procedure. The Nazis’ cited the American eugenics ideology as their model behind their “ethnic cleansing”. The systematic murder of over 250,000 disabled people between 1939 and 1945 helped to finally dilute the fierce support for engineering a master human race here in the U.S. The population of people with intellectual disabilities in public institutions peaked at 194,650 in 1967 (Community for All Tool Kit, 2004). 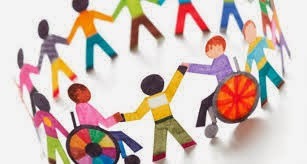 Starting around the 1970’s, we began to see the deinstitutionalization of what is regarded as the disabled population. Between 1970 and 1984, 24 institutions in 12 states were closed, by 1988, 44 institutions in 20 states had been closed, and by 2000, there were 125 closures, or planned closures, in 37 states (Community for All Tool Kit, 2004). One reason for this new trend is that in the first half of the 1940’s, psychiatrists treating war veterans for combat-related mental illnesses began to realize that treatment for mental illnesses in civilians would be best treated outside traditional institutions (United States). Also, conscientious objectors during World War II refused to serve in the military based on religious and moral reasons. As alternatives, roughly two to three thousand were sent to work in institutions and asylums that were understaffed (Deinstitutionalization). They witnessed firsthand the abuse suffered by the institutionalized and began to log their experiences. If not for them, the reality of institutional life described earlier would likely not have been brought to the forefront of people’s awareness. In 1946, Life magazine printed an explosive account, “Bedlam 1946: Most U.S. 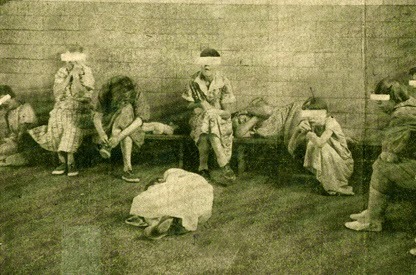 Mental Hospitals are a Shame and a Disgrace”, that depicted the atrocities endured by the institutionalized. This particular exposé was based on photos and information gathered by the conscientious objectors and on the firsthand witnessing of the reporter Albert Q. Maisel. At the same time the exposé was published, a public campaign to improve the living situations and overall care and treatment of people with mental illness was launched by the National Mental Health Foundation (NMHF), an extremely influential entity to the cause. Articles announcing prominent figures such as former Supreme Court Justice Owens and Eleanor Roosevelt as supporters of this movement were sent to newspapers across the nation (Taylor, 2003). Mrs. Roosevelt even met with the Conscientious Objectors personally and supported them through her national newspaper column, “My Day” (Taylor, 2003). Throughout the late 1940s and into the 1950s, NMHF conducted aggressive public awareness campaigns to change public attitudes toward people with mental illness (Taylor, 2003). A social movement sprung to life. More and more exposés in the following years peeled back the layers of secrecy shrouding these abominations of our country’s history such as the one at Willowbrook Hospital by Geraldo Rivera. Furthermore, doctors and parents outraged over the treatment of patients in this institution began going public. They picketed the administration building, blocked traffic on the street and talked to reporters (Dugger, 1993). Communities were shocked to learn of the horrific environments the disabled were being forced to live in. Public sentiment towards the disabled began to change. The powerful philosophy of the Civil Rights Movement of the 1960’s opened up the eyes of the United States government. By this time important political figures, such as Senator Robert Kennedy and President John F. Kennedy, were formally denouncing the revolting circumstances of the nation’s asylums and called for federal policy changes in the treatment of those with mental illnesses. Rosemary Kennedy, one of the President’s sisters, was described as slow and possibly dyslexic and mentally retarded. Her family chose to place her in an institution. Perhaps this was the strongest motivator in the Kennedys’ fight for equal rights for the disabled. “The time has come for a great national effort,” stated President Kennedy (Kennedy, 1963). In his first year in office, President Kennedy established the President’s Panel on Mental Retardation. Six task forces were created and charged with conducting an “intensive search for solutions” to the problems experienced by people with mental retardation (Minnesota Governor). The 1962 report of the Panel on Mental Retardation heralded the beginning of federal involvement and fiscal aid to states (Minnesota Governor). The report contained 112 recommendations under the headings of research…a new legal and social concept of mental retardation, increased educational opportunities to learn about mental retardation, and public education and information programs (Minnesota Governor). The Community Mental Health Act of 1963 (CMHA) was legislation passed by Kennedy’s administration which played a large part in the deinstitutionalization trend. The CMHA provided grants to states for the establishment of local mental health centers, under the overview of the National Institute of Mental Health (Community Mental Health Act). In 1965, an Intermediate Care Facility (ICF) program was set up for the elderly and disabled adults under the Social Security Act (Lakin, Larson, Salmi, Scott, 2009). Three outcomes were intended by proponents of this legislation: 1) to provide substantial federal incentives for upgrading the physical environment and the quality of care and habilitation being provided in large public ID/DD facilities; 2) to neutralize incentives for states to place persons with ID/DD in nonstate nursing homes and/or to certify their large state facilities as SNFs; and 3) to provide a program for care and habilitation (“active treatment”) specifically focused on the needs of persons with ID/DD rather than upon medical care. Although the population of state facilities continued to decrease on a yearly basis states overwhelmingly certified their public institutions to participate in the ICF program (Lakin et al., 2009). Proponents of community based services used statistics generated by the ICF program to propel their argument. They argued that the program provided an incentive to maintain large state facilities by offering federal funding. Funds that could have been diverted to develop and support community services and programs were instead used to renovate large facilities in order to receive these federal funds. This model also promoted a single standard for care for ICF residents regardless of the nature of their disability or degree of capacity for independence. Section 2176 of the Omnibus Budget Reconciliation Act (OBRA) of 1981 created the Medicaid Home and Community-Based Services (HCBS) waiver program. This was passed in order to provide non-institutional services to individuals who are disabled that were in or at risk of being placed in institutions. However, many in the advocacy field began to get a sense that there were many more people with ID/DD living in nursing homes than were appropriately served in them (Lakin et al., 2009). Congress attempted to rectify the situation by passing the OBRA of 1987 which restricted the criteria for patients permitted to enter a Medicaid approved nursing facility to ensure that only individuals needing the nursing and medical services offered would be admitted. The OBRA of 1986 proved to do very little as the barrage of court cases of the 1990’s suing facilities in violation proved. There have been court cases over the course of the last half century that has given rights to those who are disabled and their families. There have also been cases in which people or entities have been found guilty of discrimination based on disability even after legislation has been passed in order to end this type of discrimination. A landmark example is the Olmstead decision (Olmstead v. L.C and E.W). In 1999, two women, institutionalized by the state of Georgia, fought for their right to live in their own home in their community without losing government benefits. Georgia claimed that by allowing these women to move into the community, it would lead to the closing of state-run facilities and disrupt government funding to individuals in these facilities. However, the Supreme Court found that forcing individuals to remain in institutions in cases where their attending physicians felt it was unnecessary violated their rights as written in Title II of the ADA. The 'integration mandate' of the Americans with Disabilities Act requires public agencies to provide services "in the most integrated setting appropriate to the needs of qualified individuals with disabilities." (Supreme Court Upholds ADA 'Integration Mandate' in Olmstead decision) The Court noted that confinement in an institution severely diminishes the everyday life activities of individuals – including family relations, social contacts, work options, economic independence, educational advancement, and cultural enrichment. (United States, 2000) It further found that it was a violation of a person’s rights as written in Title II of the ADA to force them to be institutionalized in order to receive their Medicaid benefits. Medicaid is the largest health insurance program used by low-income persons with disabilities. Approximately twenty percent of the American population with severe disabilities has no other health coverage. This means that Medicaid serves over five million consumers who have no other way of covering their life-sustaining needs. This ruling increased the momentum of deinstitutionalization and began a trend towards home and community-based services (HCBS) (Stroman, 2003). However, it was apparent that not enough had been done. Society made disabled people "invisible by shutting them away in segregated facilities" Rep. George Miller (D.-Calif.) said in a Congressional debate on the ADA bill in 1989. (Supreme Court Upholds ADA 'Integration Mandate' in Olmstead Decision) Out of sight, out of mind had been a long time standard for how to “deal with” individuals with mental and physical disabilities. Medicaid has been referred to having an “institutional bias” because it has historically preferred nursing-home facilities, such as ICF’s, to community-based long term care (LTC). In 2005, Medicaid paid $101 billion for LTC services, the majority of which was for institutional care (63 percent). (Coffey, 2008) In 2008, nationally, HCBS recipients made up 84.9 percent of the total HCBS and ICF recipient population but used only 65.1 percent of total HCBS and ICF-MR expenditures (Lakin et al., 2009). The per-person expenditures for recipients of HCBS services were lower in every state than those for ICF recipients (Lakin et al., 2009). The Deficit Reduction Act of 2005 (DRA) helped to further deinstitutionalization by making very significant changes to state Medicaid coverage of long-term care services. States now have the option to provide home and community based services (HCBS) as a state plan benefit (Coffey, 2008). Since its inception, the number of people requesting HCBS has steadily risen. In 2006, 280,176 individuals were on a waiting list for HCBS services, up from 206,427 individuals in 2004 (Crowley & Risa, 2003). The DRA also enacted the Money Follows the Person program (MFP) which is a program intended to help individuals currently receiving services in institutions transition into their communities and allow them to self-direct their care plan. The government provides a cash incentive for states to expand their HCBS program funding. The Medicaid dollars will “follow the person” so that these individuals will be able to retain their Medicaid coverage and have it delivered through HCBS programs. It already matched at least half of state Medicaid expenses. Under MFP, states will receive an enhanced match for the HCBS services provided for the first twelve months to each individual transitioned under the program (Coffey, 2008). A state plan option allows for states to provide HCBS waiver services without needing to get a waiver for individuals with disabilities up to 150 percent of the poverty level. As promising as these options appear to be, they are very narrow in scope and do not allow for all of those who wish to live in their communities to do so. Furthermore, few states have taken up the state plan option to date (Crowley & Risa, 2003). However, there is still an institutional bias in the Medicaid system. What this means is that the way Medicaid has been set up promotes the institutionalization of individuals as opposed to home and community based services (HCBS). In June 2008 an estimated 51.8 percent of HCBS recipients received services in settings other than the home of natural or adoptive family members (Lakin et al., 2009). While there has been a trend for wanting deinstitutionalization the numbers show that a large number of disabled individuals have no choice but to enter an institution. In 2005, 59 percent of Medicaid spending on long-term care and support services was spent on institutions whereas the national average of the same type of spending on home and community based services was only 37 percent (Crowley & Risa, 2003). There is currently a large movement towards person-centered planning, where the individual chooses what to do, where to go and who to be with. We will discuss this further in Part IV. Next week, Part II, we will look at legislation that has been passed in the areas of accessibility and education. Institute of Mental Health, n.d. Web. 20 May 2010. Life Magazine. 6 May 1946: Print. Online. Advocado Press, 2003. Web. 4 September 2010. 2001. Web. 14 September 2010. http://www.famousamericans.net/samuelgridleyhowe/. Workshops - Yay or Nay? There is a great debate taking place on whether or not sheltered workshops should still be an option for people with disabilities who are out of school. Read my pros and cons on workshops here. One of the main arguments people have against closing down workshops is the fear that the individuals working there will have no place to go since businesses don’t tend to hire people with disabilities. The numbers seem to back that up since the unemployment rate of people with disabilities is twice that of people without disabilities, according to the Department of Labor (as of August 2014). You can find more informationon that here. How did Vermont do it? The University of Vermont received a grant to build programs for integrated employment in the 1980’s. They worked with state disability agencies and its success over time was enough for Vermont to realize that sheltered workshops were not how the state wanted their citizens with disabilities to be treated. Workshops were phased out over a 4-year period: new entries into workshops were no longer allowed and their funding was incrementally cut. Of course there were fears from the families who would be directly affected by this and rightly so. As parents, we want our children to be safe and secure, accepted by peers and part of something bigger than themselves. Could these desires be realized if workers with disabilities don’t have contact with others who are also disabled? Is there a job out there they could actually do and feel good about doing? Would society in general accept them? It turns out, the answer is yes! In Vermont, about 80% of the people who used to be in workshops found employment in an integrated setting. The rest found other community-based services. According to the article, “In fiscal year 2013, the average wage for supported employees was $9.26, more than 50 cents above the state’s minimum wage and $2 above the federal minimum wage.” How incredible is that?! Some argue that the reason Vermont was able to be so successful is because it’s a small state. But isn’t that a cop out? As a parent to a teenager whose CP severely impacts her, I worry about her future all the time. What will she do when she ages out of school? Today, I can’t picture a job where she can be independent because of the extremity of her physical disability but who knows where we’ll be in terms of technology and employability six years from now? My greatest hope is that all states work towards achieving the successful model Vermont has realized so that our community has as many options as it can. Let’s not continue to set the bar so low for our people! Wells Fargo has agreed to cancel her eviction and is in talks with her attorney. There have been numerous calls and letter of support as well as donations to help Sandra. Her attorney is setting up a fund for her. If you care to help, you can call 203-324-7744 or email Sandra Weiler at mrsweiler@aol.com. So far, cerebral palsy and cancer hasn't stopped Sandra Weiler. Will Wells Fargo follow suit? Could it be that the banking industry is doing the right thing? Taking what seems to be a "human-centered" approach rather than a "dollar-centered" approach, Wells Fargo has agreed to review a particular case and put their decided eviction of Sandra Weiler, a woman with cerebral palsy, on hold. At first glance, automatic assumptions would run rampant through many people's minds about how this woman ended up getting an eviction notice. Things like "government assistance" and "moocher" might occur to some people (ok, LOTS of people) reading this. But before you make up your mind, let me tell you that the woman you see in the still of this video has her PhD, has owned a daycare and is a special education teacher who currently teaches at a university in Connecticut. She was also fighting cancer and has recently lost her medical coverage. Yes, I know banks are in it for the money but aren’t there times where a person could actually just be going through a rough patch and be given an extension? I’m so glad Sandra Weiler was given an extension and I hope that Wells Fargo will allow her to stay in her accessible home which she has customized to her particular needs to give her the independence every human being deserves!